Out of Lagos for a couple of days! 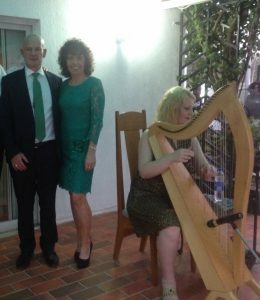 We were flown to Abuja, the capital of Nigeria, for me to play harp for the St. Patrick’s Day party at the Irish Embassy. It is one of the events the diplomatic corp look forward to every year, and dignitaries from all over the world were in attendance. 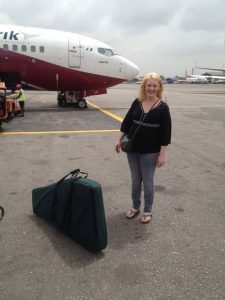 Getting the harp through the airport was a bit of a challenge, but Arik Air had assigned one of their managers to accompany us to make sure everyone from security to the cabin crew knew that it was allowed. The harp even got its own row of seats on the plane! At the airport in Abuja, we were picked up in one of the ambassador’s bullet-proof SUVs. Getting out of Lagos, Nigeria finally felt like real Africa. The big city is exciting, but seeing more of this country was even better. 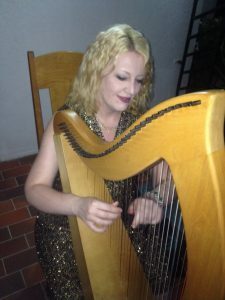 At the embassy, I played Irish tunes as guests arrived and mingled on the grounds, eating lamb and drinking Guinness. 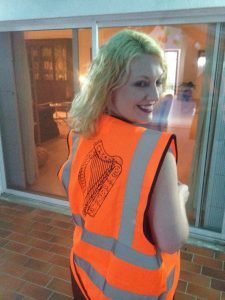 As the harp is the national symbol of Ireland, it was everywhere (even on the back of their high-visibility vests) – but this was the first time they had an actual harpist performing! A big thank you to Ambassador Hoy and all of the staff at the Irish Embassy who invited me to play and arranged all of the travel for us. Happy St. Patrick’s Day! This entry was posted in Nigeria, Private Parties and tagged abuja, blevinsong, irish embassy, nigeria, st. patrick's day, video. Bookmark the permalink.